When I first completed this art piece, heck when I first envisioned the piece, the message behind the work was amorphous at best. 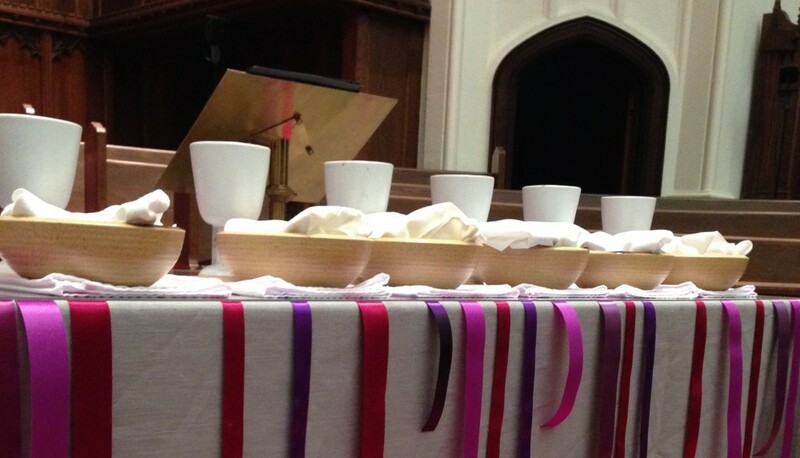 A few weeks before Lent Pastor Ginger, senior pastor at Foundry UMC in Washington D.C. approached me with an idea. Her sermon series for Lent would explore the missed connections in life. We are primarily a technology dependent society. People are more connected than ever before. Fast paced technologies allow us to communicate and be available to others 24/7. Yet, loneliness is “on the rise.” During the 2015 Lenten journey, we will explore issues that strain and threaten truly life-sustaining human connections – connections with others, ourselves, and God. Ginger spoke to me about ribbons that would appear suspended in mid air, disconnected from the whole, as a way to visually represent all the missed moments. I was drawn to the theme, but how to bring her message with the ribbons together was not clicking for me. In my doodling I started drawing broken ribbons. Then, probably because I watched The Imitation Game over Christmas, I began to see morse code in the broken lines. A language that can seem chaotic and broken, unknown, with no idea of how to make sense of it all. And yet, the language can be deciphered and can begin to tell a story. This is life to me. So many missed connections between each of us, a missed opportunity to share some light. And yet, God exists within the silence and the chaos. At first, as the image emerged I envisioned the morse code revealing a pattern in life, a pattern connecting all the missed connections. But, how do we make sense of all the chaos, the broken relationships, the lost souls? The first weekend of lent I attended the Foundry Women’s retreat where Denise Dombkowski Hopkins, professor at Wesley Theological Seminary, spoke about the Psalms and the laments. So often when someone yells out, “God, why?” we believe the person is requesting our answer. With this in mind we attempt, in a desire to connect and heal, to answer the questions or worse we chastise the questioner’s lack of faith. Denise’s suggestion was to think of the lament, “Why God?” not so much as a cry for information as a cry for companionship, for a shoulder, a mutual tear as you both wonder aloud about the chaos. 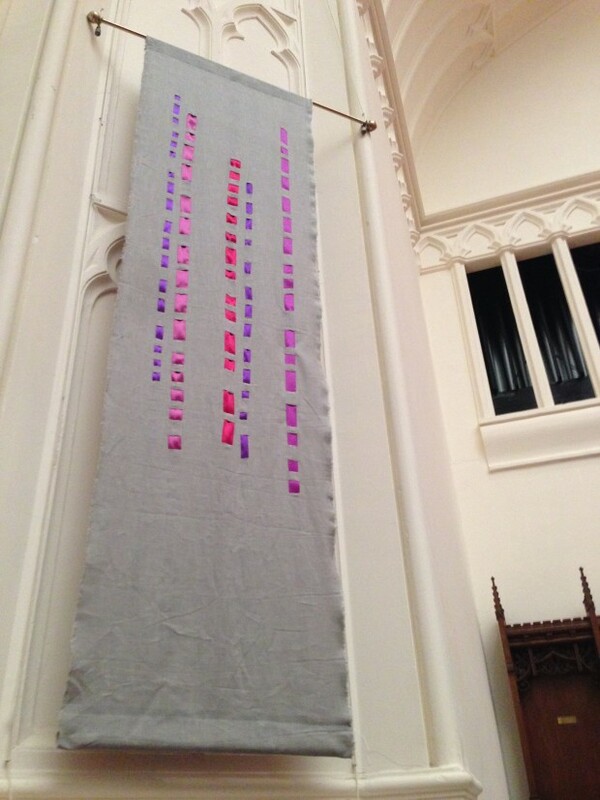 All this came together so that even as the banners hung in the sanctuary for three weeks a new message jumped out at me. The ribbon in each banner is morse code. Morse code can seem chaotic and un decipherable, especially to us lay people. Just dots and dashes haphazardly placed in the universe. Life can often seem haphazard, a bunch of disconnected moments, people and events without any connecting thread. And yet, while we may not know why there’s chaos and disconnection in our world God weeps with us, and is in pain with us. God knit each of us, every single one. Even as life can seem clouded, what is clear is the miracle of creation happened in every single person. In these moments of chaos, our call is to remember this and connect with this miracle in each other. The call in the chaos, the pattern in the disconnection does not attempt to decipher why, it simply calls us to remember who, who we are, who we are called to be, and who God made us to be. Note: Many thanks to executive pastor Dawn Hand for helping make this a reality. A last minute drive on a snow day to Joann’s and some on the fly fabric and ribbon choices, along with finding a sewing machine, made this happen.